With a stay at Sandcastle Oceanfront Resort by Patton Hospitality in Myrtle Beach (South Myrtle Beach), you'll be a 5-minute drive from Family Kingdom Amusement Park and 8 minutes from The Market Common. 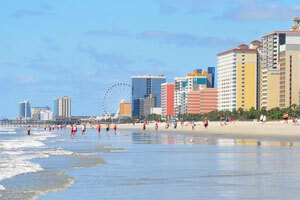 This golf hotel is 2.5 mi (4.1 km) from SkyWheel Myrtle Beach and 5.6 mi (8.9 km) from Broadway at the Beach. Make yourself at home in one of the air-conditioned rooms featuring kitchens with refrigerators and microwaves. Rooms have private balconies. Complimentary wireless Internet access is available to keep you connected. Conveniences include coffee/tea makers and sofa beds. At Sandcastle Oceanfront Resort by Patton Hospitality, enjoy a satisfying meal at the restaurant. Unwind at the end of the day with a drink at the bar/lounge or the poolside bar. The preferred airport for Sandcastle Oceanfront Resort by Patton Hospitality is Myrtle Beach, SC (MYR).